To demonstrate motor and sport skills while counting to 100. Students should have prior practice of dribbling, jumping rope, running, toss and catch, and striking. Worksheet and pencil for each student. 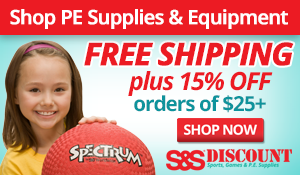 5-7 playground balls, jump ropes, hool-a-hoops, beanbags, paddle and balls. Students will complete the 100th Day Activities/PE worksheet by placing a check mark next to each task after completing it. If someone finishes early, ask them to make up their own 100th day activity. Using a teacher checklist, note the students motor and sport skill performances. Submitted by Elizabeth Thomas who teaches at Eastern Elementary in Glasgow, KY. Thanks for contributing to PE Central! Posted on PEC: 3/3/2009. Viewed 39203 times since 1/26/2009. This sounds like a great idea and I would love to check it out but I am having trouble opening the pdf file. Is there any way you could send this idea to me via email?